In 2018, Americans held about $1.5 trillion in outstanding student loan debt. In Colorado alone, 761,000 borrowers owe $26 billion in student debt. Several factors have led to this huge debt burden, including shrinking public investment in higher education, the increasing requirement of higher education in the labor market, and institutional competition for student enrollment. The explosion of student debt has contributed to the lack of economic mobility for many Coloradans. A way to combat student debt increases is to help borrowers navigate the private loan sector. Some private loan servicers are at fault for rising student debt, and a few have even made headlines for their predatory practices. In addition to forcing borrowers into high-cost repayment plans, private loan servicers have consistently presented misleading or inaccurate information on crucial aspects of their loans. And it seems the problem has become more acute: A 2017 report by the Consumer Financial Protection Bureau shows borrower complaints against student loan servicers were up 429 percent from the previous year. As outstanding student debt has increased, government regulation of lending has been severely diminished by lax federal oversight and an overall decline in consumer protections. It took a recent federal ruling to compel the United States Department of Education to implement a suite of regulations protecting borrowers affected by school closure or fraud, but a larger crackdown seems to be far away. Fortunately, eight states used 2017 and 2018 to mend fractures in the system that expose borrowers to fraudulent and unfair practices at the hands of loan servicers. While some of the states took very narrow steps to help borrowers, others have looked at the issue in a more comprehensive way. These holistic laws, commonly known as a “Student Loan Bill of Rights” are essential at a time when more people need a postsecondary education to get a good job. While Colorado has been somewhat behind the curve on this nationwide trend with some caveats (Colorado did pass HB18-1217, which created temporary income tax credits for employers who contribute to employee 529 accounts), legislation introduced on the first day of session, SB19-1002, could help ensure Colorado’s students and their families don’t need to borrow for higher education at their own financial peril. Two states that have moved to protect borrowers with comprehensive relief bills are Washington and Massachusetts. While many other states have taken a piecemeal approach to student debt, Colorado should move forward with a plan that’s similar in scope to the problem it’s confronting to truly deal with the significant problem at hand. Fortunately, Colorado can learn from efforts in Washington and Massachusetts and would do well to implement its own versions of these laws. There are three important categories that a comprehensive “Borrower’s Bill of Rights” should include. A look at how Washington and Massachusetts tackled these issues provides a roadmap on what Colorado can do. Various states license student loan servicers that operate within their borders. This ensures the servicers undergo oversight and follow the same process other businesses do to get established. While the process is relatively painless — submitting financial records and paying application and other fees — it ensures there’s a record of loan servicers operating in the state, as well as the amount and type of loans they hold. Connecticut, which passed the first Borrower’s Bill of Rights in 2015, released a report in 2017 on the licensing aspect of the bill. In total, there were seven examinations of student loan servicer licensing, which helped many borrowers who had loans with those servicers. A continual check on licensing requirements for student loan servicers will only help to make the process more transparent and better for borrowers. With the federal government abdicating its responsibility to student loan borrowers, it has become even more important for Colorado to step forward and lead, and an ombudsperson is one important way to do that. 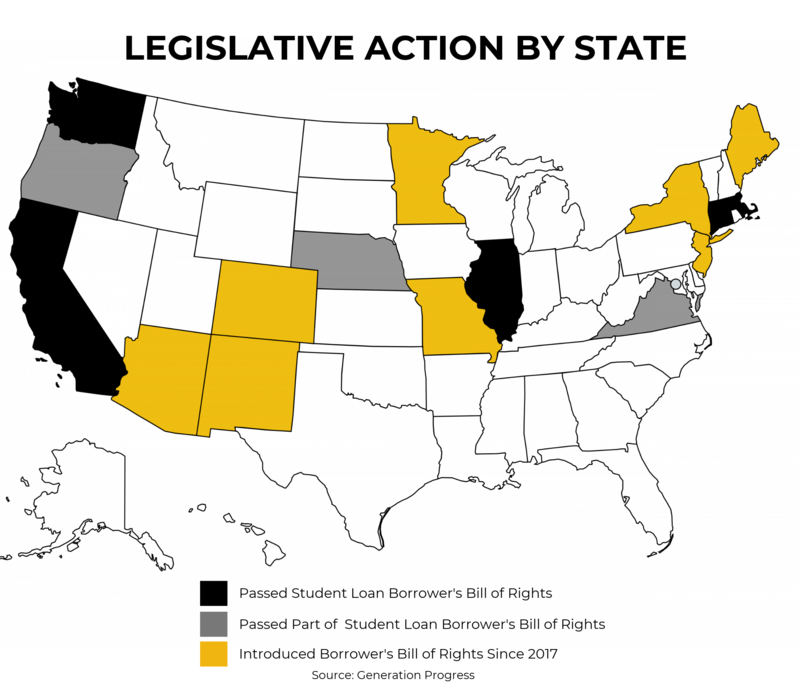 Any holistic “Borrower’s Bill of Rights” needs to explicitly put a stop to predatory practices that harm consumers and force them to pay more money than they owe. In concert with licensing servicers, this includes putting an end to practices such as falsifying or purposely omitting important loan information, bad reporting mechanisms that risk borrowers’ misunderstanding their repayment plans, and steering borrowers toward repayment plans that cost more. While most of the comprehensive legislation has been enacted recently — leaving little data to study — the individual pieces have proven to be effective at various levels of government and worthy of tackling the scope of the student debt problem. Washington: Legally requires student loan servicers to obtain a license in order to operate within the state. Massachusetts: Legally requires student loan servicers to obtain a license in order to operate within the state. Colorado: Includes provisions to require loan servicer licensing in order to operate legally in Colorado. The license application must be accompanied by proof of financial status, a history of criminal convictions, a license fee of $1,000, and an investigation fee of $800. In Massachusetts, its plan prohibits student loan servicers from engaging in unfair methods of competition or deceptive acts or practices.